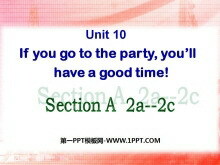 《If you go to the party you'll have a great time!》PPT课件17 Talk with your friends and complete 3a、3b and 3c A: What problem do you have B: . What do you think I should do?/can you give me some advice? 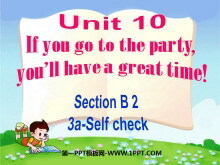 A: I ..
《If you go to the party you'll have a great time!》PPT课件16 Look at the statements below and then skim the passage. a. if people have problems they should get advice from an except. 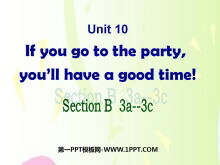 b. if people have problems..
《If you go to the party you'll have a great time!》PPT课件15 if 引导的条件状语从句 时态－－主将从现 主句一般将来时从句一般现在时 例句１ 如果你努力2018年送彩金网站大全 你的梦想将会实现。 If you work hard your dream will come t..
《If you go to the party you'll have a great time!》PPT课件14 Discussion If I eat snacks in the reading roomthe assistant will stop me. If I talk on the phone in the reading roomthe others will be mad. 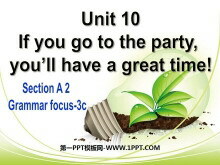 If I smo..
《If you go to the party you'll have a great time!》PPT课件13 Chant If you go to the party，you will have a great time. 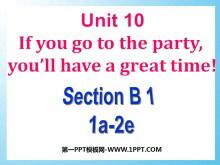 If you wear jeans to the party，the teacher wont let you in. 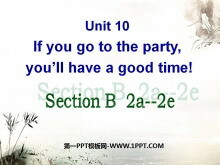 If you have the party we will..
《If you go to the party you'll have a great time!》PPT课件12 Lets enjoy a song! 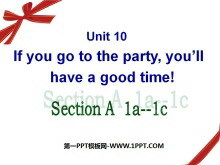 If you are happy If you're happy and you know it clap your hands If you're happy and you know it clap your hands If you're happy ..
《If you go to the party you'll have a great time!》PPT课件11 If意为如果，表示条件，if引导的句子是从句，用现在时态，主句则用将来时态。也就是所谓的主将从现。 If you eat less you will be thinner. 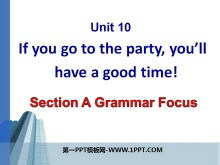 If you work hard..
《If you go to the party you'll have a great time!》PPT课件9 Revision 选词填空。 meeting video chocolate taxi upset advice organize 1. If you walk there youll be late for the ________. 2. 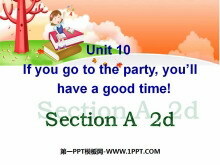 If they watch a ______..
《If you go to the party you'll have a great time!》PPT课件8 Look at the pictures and make sentences with if. 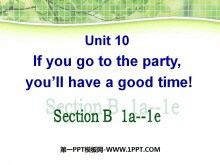 If you go to the party with Karen and Anna youll have a good time. 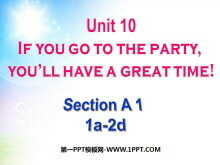 If you wear jeans to the party th..
《If you go to the party you'll have a great time!》PPT课件7 Match the statements with the pictures [a-d]. 1. ___ I think Ill wear jeans to the party. 2. ___ I think Ill stay at home. 3. 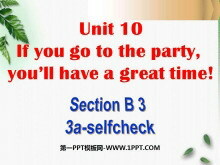 ___ I think Ill take th..
《If you go to the party you'll have a great time!》PPT课件6 知识目标： 熟练掌握句型： A: What will you do if you visit an old peoples home? B: If I do that Ill bring the old people some flowers. 熟练掌握并能正..